The advent of the digital camera was supposed to bring "instant images," but reality seems to be a bit different. You can use a conventional camera and get prints back in an hour, or use a digital camera and never get prints back at all. In both cases, if you leave the pictures in the camera instead of (a) developing the film and scanning the pictures or (b) downloading the pictures to your computer, the result is (c) "instant images" take about as long as they always have. But now your consumables are just batteries, instead of both batteries and film. Such is the measure of progress. Yet more recently added photos of the meeting and The Box, plus the Movie. Pi Webmaster and occasional Mac guru Lawrence Charters guides the Question and Answer session that begins each meeting. This session has several purposes, depending on who you are: (1) it distracts the audience while presentations are set up; (2) it is a contest to "stump the gurus;" (3) it is an opportunity for members to ask potentially embarrassing questions while they are safely anonymous in the darkness of the auditorium; or (4) all of the above. 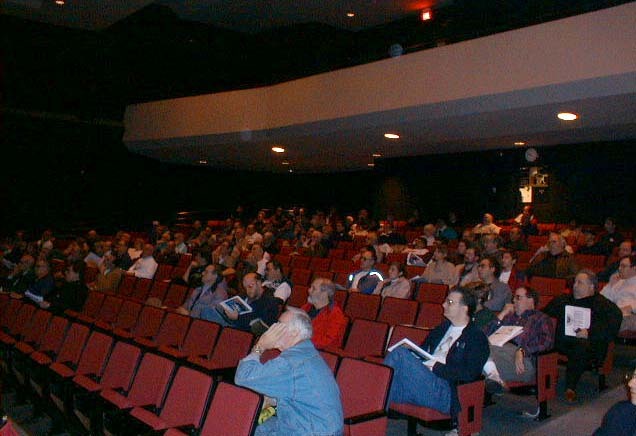 Well before the meeting begins, the auditorium starts to fill. Some come to ask questions during the Q&A (see above), while others watch vendors struggle to set up equipment despite the fact that vital cables did not arrive with their luggage. This is frequently just as entertaining as any of the planned activities. 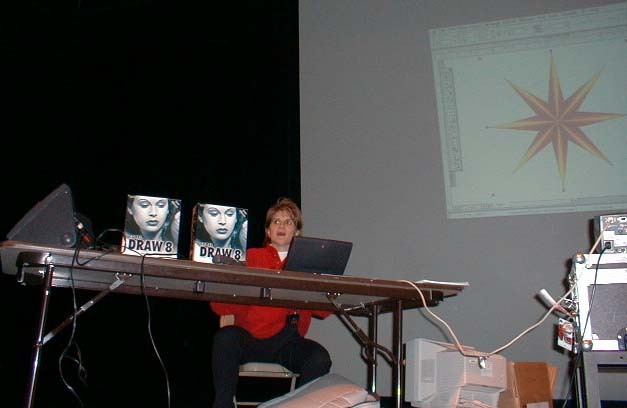 The Corel representative began her presentation by admitting this was her first user group presentation. She did very well, but definitely needs to brush up on the Macintosh interface and screen terminology. 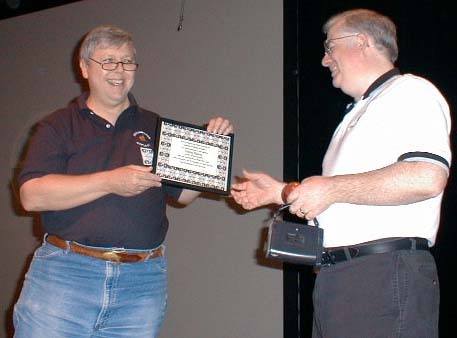 Lawrence Charters getting an award from Tom Witte (the award actually belonged to David Harris; Lawrence's award hasn't been found). 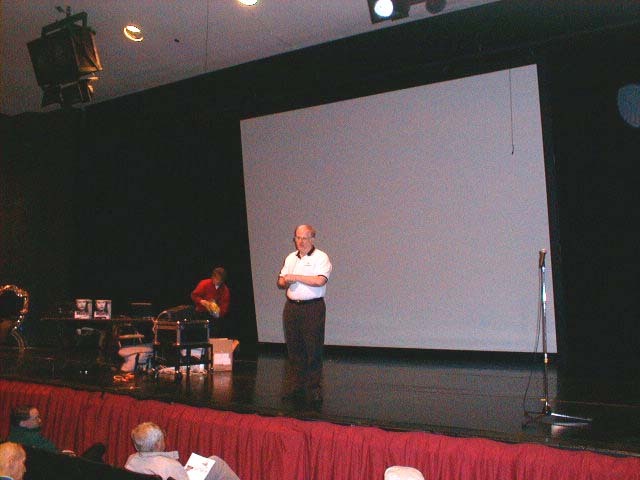 Lawrence is holding a Kodak DC50 digital camera, used for many of the photos on the other meeting page. 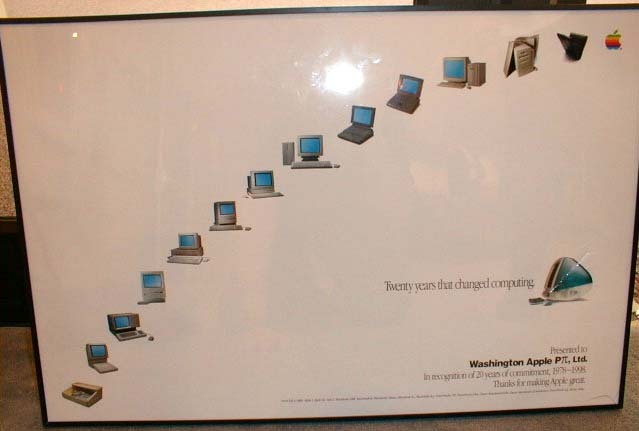 Closeup of the commemorative poster presented to Washington Apple Pi by Brighid Brady-de Lambert, Apple User Group Program Manager. The poster is on display in the Pi's office. Tom Witte sets up a shot of the giant Mac OS 8.5 commemorative box sent to the Pi by Apple. 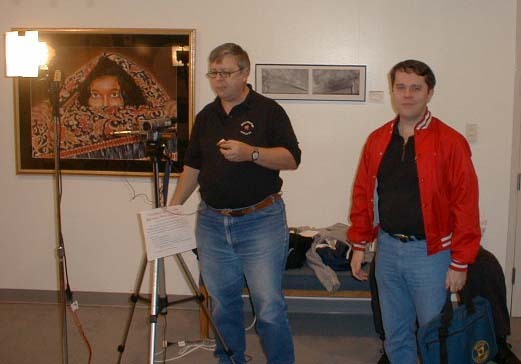 To his left is Dana Schwartz, one of the founding members of Washington Apple Pi. 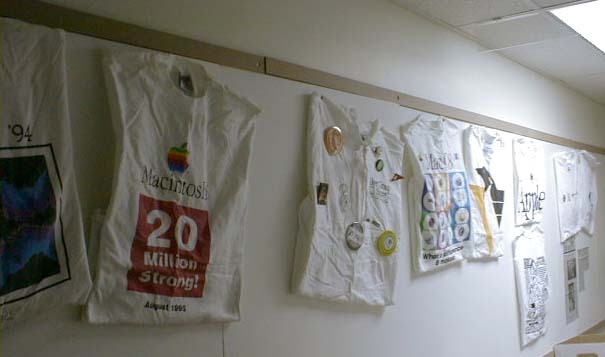 Commemorative T-shirts line the main hallway of the Pi's office. These have nothing to do with the meeting but Don included them with the rest of the pictures so -- here they are.